Our data storage needs increase at a rate of almost 15 million gigabytes every day. And while solid-state drives are becoming more popular, many people still use conventional hard drives and magnetic tapes to store their data. But there may not be enough of these devices to keep up with our data-hungry lives, which is why scientists are turning to alternative storage devices—such as storing data on individual atoms. Scientists at the École Poltechnique Fédérale de Lausanne (EPFL) have made a significant breakthrough in the use of single-atom magnets—storage devices made up of individual atoms stuck on a surface. Each atom is able to store a single bit of data that can be written, read and rewritten through the use of quantum mechanics. Since atoms are small enough that they can be packed together densely, single-atom storage devices could potentially hold immense amounts of data in a very small space. 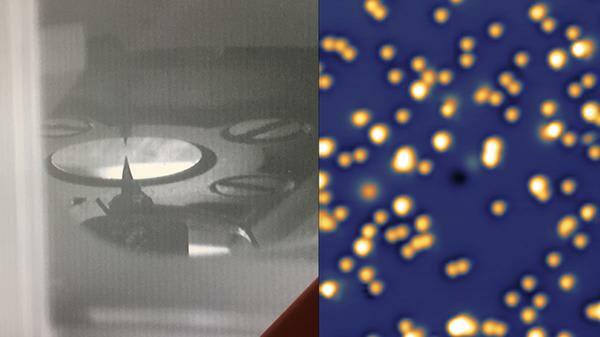 In a new study published in Physical Review Letters, researchers at EPFL’s Institute of Physics tested the stability and resilience of a magnet consisting of a single holmium atom. The scientists used a scanning tunneling microscope, which allows for imaging at the atomic level. Scientists then exposed the magnet to extreme conditions such as high temperature and intense magnetic fields—forces that normally demagnetize single-atom magnets. Using a scanning tunneling microscope to study atoms for single-atom storage capabilities. The results are promising. The holmium atoms remained magnetized up to a temperature of 35 Kelvin, or almost -400°F, which is hot for a single atom. The atoms also retained their magnetization in a magnetic field exceeding 8 tesla—the strength of magnets used in the Large Hadron Collider. These results indicate that a storage drive that uses holmium single-atom magnets could withstand the rigors of commercial production and maintenance—an important development in the quest to make quantum computing commercially viable. “We have demonstrated that the smallest bits can indeed be extremely stable, but next we need to learn how to write information to those bits more effectively to overcome the magnetic ‘trilemma’ of magnetic recording: stability, writeability and signal-to-noise ratio,” said Fabian Natterer, the study’s lead author. This study builds on IBM’s success in storing information on a holmium atom in 2017. However, single-atom magnets still need a lot of work before they can become commercially viable. Proving their ability to withstand heat and magnetic fields is a big step toward realizing their computing power—and putting single-atom magnets in the hands of consumers. Read more about the latest developments in quantum computing at Google’s Bristlecone Quantum Computing Chip Achieves 72 Qubits.